A pretty cool movie about the world of young, competitive chess and one student who tries to make sense of it all in the context of his life. Searching For Bobby Fischer is a unique movie about a boy impressing everyone around him with his unbelievable skills and mastery of chess. Josh doesn’t just play the game; he makes plans and sees ten steps ahead. He can see the board in his mind and knows exactly what his opponent will do next and then what Josh will do in retaliation. The movie is about Josh and his dad, Fred (played by Joe Mantegna), getting into the competitive side of the game. There’s a fantastic scene early on, where Josh plays against Fred and has to show his dad that he really is as great as his mother says. From that point on, the two of them go on a sort of mission together. It involves getting Josh the right teacher, (Bruce, played by Ben Kingsly), and then getting Josh into the competitions. The movie works because it is filled with interesting scenes. Some of them are about Fred, like the scene where he tells Josh’s teacher off, and others are about Josh’s lessons with Bruce and his competitions. This movie is very careful about how it presents chess, never wanting to get too deep into the game, but instead to present the picture of this boy’s life as he learns it. There is a sense of humor behind many scenes, and the a real interesting journey that the movie takes us on. 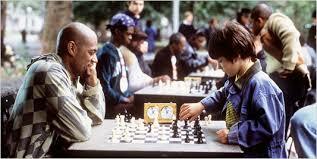 Searching for Bobby Fischer is a movie about a boy who is great at playing chess. That doesn’t exactly sound like the most interesting material for a movie. If it was about just watching chess games, one after another, than it would probably be incredibly boring. And this is coming from someone who loves chess. But the fact is, it is two people sitting at a table, mostly waiting for the other person to move a piece. It is a game more than a sport and a thinking game, where most of the work goes on inside the person’s head. How do you translate all of that, or any of it, to film? The answer is you don’t make the movie about chess. You make it about the boy and his life and his family. This boy, Josh, is just a regular kid at the start of the film, hanging out with his mom (Joan Allen) and dad (Joe Mantegna.) but then one day he goes wandering off and ends up in Washington square park, watching the locals sit at tables, playing chess, and hustling their customers. He catches the eye of Vinnie (Lawrence Fishbourne), who is one of these locals, and Josh ends up taking away a wooden piece of a black knight on a horse. He becomes infatuated with the piece and how cool it is (like a toy), and decides to learn the game that it goes to. He does this by going back to the park and watching the game be played. One day Josh is out with his mom, walking through the park, and gets her to pay a man at a table to play a game with Josh. The boy sits down, starts the game, and plays pretty amazingly. His mother is blown away. She didn’t even know that Josh knew the rules, and suddenly he’s not only playing, but he’s competing. He doesn’t beat this guy, but he certainly shows his mother that he knows what he’s doing and even gets the attention of some of the locals, like Vinnie. Josh’s mother tells his father, Fred (Mantegna), and Fred goes and finds and old chess set. He didn’t think Josh knew how to play either, but now that he hears this news from his wife, he wants to see for himself. This is where the movie starts to get good. The first game they play, Josh loses. He loses it on purpose for a number of reasons. One is that he wants to go out to do what they were going to do. The second, and real reason, however, is that he doesn’t think it’s okay to lose to his father. When Josh goes upstairs, his mother explains to Fred why Josh lost. They sit Josh down for a talk about it being okay to play his best, and then we get the real game. This second game is a wonderful scene. You could tell in the first game that Josh knew what he was doing, even while losing, because he was the one that pointed out the check mate he was in (that he lost), to his father. And he did it with just moving his eyes and not saying a word. Well, here in the second game, Josh makes a quick move and then runs off to play with his sister. He does that again and again, and the camera follows him around the house while Fred sits at the table pondering every move. The idea here is that Josh doesn’t need to think. He has the whole board mapped out in his head and knows what his next ten moves are going to be. He can also figure out what Fred is going to do. This lead into the competitive angle. Fred goes to an old chess library, or building where men sit at tables and play chess, and where the man who works there is an old chess teacher. This man, Bruce, (played by been kingly), refuses to teach Josh. He’s not a teacher anymore, and is happily retired. Bobby Fischer might be the last kid, who Bruce taught, and that boy played tremendously and accomplished greatness in chess, but then he disappeared. He stopped playing and that meant that all of Bruce’s hard work in teaching him was gone. But Bruce doesn’t just go away. Instead, he goes to the park where Josh plays in pick up games against the locals, and Bruce stands there in secrecy watching. He’s definitely interested. Especially if there’s even a chance that this kid is as good as his father says he is. And that father, Fred, is completely convinced. There’s a scene where he goes to the school with his wife to meet Josh’s teacher (Laura Linney), and ends up telling her off because he thinks she is belittling Josh’s ability in chess. She calls it “this chess thing,” and Fred goes nuts on her, telling her that Josh is better at chess than she will ever be at anything in her life. He’s a jerk in this scene, but it shows how strongly he feels about Josh’s gift and skills. The movie slows down in some of its later scenes. Bruce agrees to take Josh on as a teacher and the two of them hold lessons together in all different locations. Sometimes it’s at the chess library, other times it’s at Josh’s house. Meanwhile, Josh continues to play games against his friends in Washington Square Park, like Vinnie. Bruce doesn’t like this. He begs Fred to make Josh stop playing they’re, saying that the kind of game they play there is a totally different kind of game than what Bruce is trying to teach him. But Fred refuses, claiming his son’s happiness is the most important thing and that Josh needs to enjoy what he’s doing. If the boy loves playing in Washington square park then Fred is not gonna be the one to put a stop to it. There is a very funny competition scene with William H. Macy as the parent of the kid who Josh is going head to head with. It starts out in a single room with the kids playing at tables in the center, the parents standing against the walls on the perimeter, and Dan Hedaya running the tournament. Then two of the parents get out of hand, end up in a fistfight, and the remaining parents who want to stay are locked into a basement room, (which is like a dungeon), while kids run down the halls and relay messages to each other, in order to give these parents updates. That scene is a lot of fun. The movie goes on to show some controversial lessons with Bruce (one where he knocks all the pieces on the floor to show Josh a clear board, and another where he belittles the certificates that claim a student is a grand master), and then the final competition. During this competition, for the first time, we really see the details of the chess game, and how Josh goes about organizing a situation where his opponent has no choice but to walk into a losing situation. I like the way they save the real detailed game for the end, as if everything that came before it in this movie was preparing us to actually watch a game. You still need to know a little bit about chess to understand the end of that game, but it’s not a big deal if you don’t. The movie really doesn’t require an understanding of the game. It is much more about the kid’s life and his experiences learning the craft. This is a fun film with lots of great scenes. There is also a terrific cast and great actors who just appear in brief cameos, because the main roles are already filled. These actors include Linney, Macy, Hedaya, and Tony Shaloub. 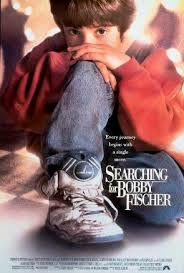 Searching for Bobby Fischer does have its occasional slow moments, but for the most part it’s an excellent film.